"Tale as old as time" may be a lyric from Beauty and the Beast (now receiving beautiful treatment on the main stage at Chanhassen Dinner Theatres), but the story of Jesus is truly a tale as old as time. Quite literally, as the life and death of Jesus is the event against which we in the Western part of the world measure time. It's a powerful story of love and sacrifice, one that has inspired world-changing movements, both good and bad. Bucket Brigade (whose founders Jeremiah and Vanessa Gamble also helm Theater for the Thirsty) is bringing back their modern, passionate, musical take on the passion play. 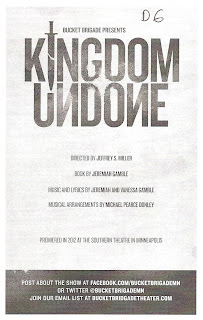 I saw Kingdom Undone at the Southern Theater three years ago and was moved by the story. This year's version features some cast changes and a new venue - Bucket Brigade's home theater space Art House North. The story feels less epic than it did at the Southern, but more intimate, as characters make frequent use of the aisles so that the music and story surround you in the former church space. 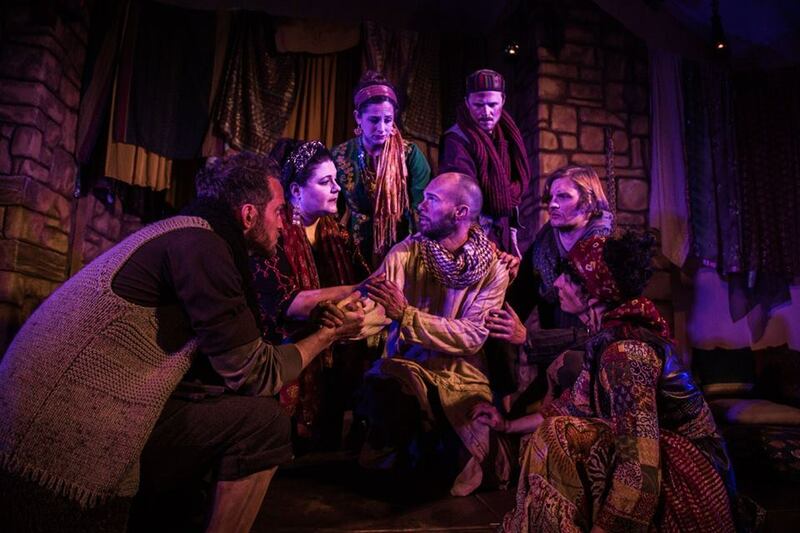 I'm not sure if the play would appeal to people not from a Christian background, but for those who are, it offers a moving and modern take on the familiar tale. The last days of Jesus play out on stage, as he leads his followers (which happily include several women) in search of a better life, and silently prepares for his death. But this is also largely Judas' story, who is presented not as a traitor, but as a true follower of Jesus who believes he is doing his part by turning him in to the authorities. He is certain that this is all part of Jesus' plan, and that armies of angels will descend from heaven to save Jesus from death and bring about a new kingdom on earth. He's devastated when he finds out that's not the case, but the rest of Jesus' followers find a reason to hope. The play is written (by Jeremiah, who also plays Jesus) in a fresh and modern style that makes these ancient characters feel real, flawed, and relatable. Despite the darkness of the story there is humor and hope to be found. The original music (by Jeremiah and Vanessa, aka Magdalena) is lovely and haunting with a Middle Eastern sound. The voices of the ensemble blend beautifully with the four-piece band under the direction of Michael Pearce Donley. The set is draped with scarves in rich jewel tones, and the wardrobe is a modern/retro mix of cargo pants and leather jackets juxtaposed with long flowing skirts and tunics (scenic design by Justin Barisonek, costume design by Nadine Grant). All of these elements combine to bring a modern and fresh feeling to this ancient tale. Everyone in the large ensemble cast gives passionate and committed performances, especially Ben Bakken, who once won an Ivey Award for playing Jesus and brings that same intensity to the role of Judas. But despite the competence of this cast, it would be nice to see some diversity, considering Jesus' message of love for and inclusion of everyone and the fact that the story takes place in the Middle East. 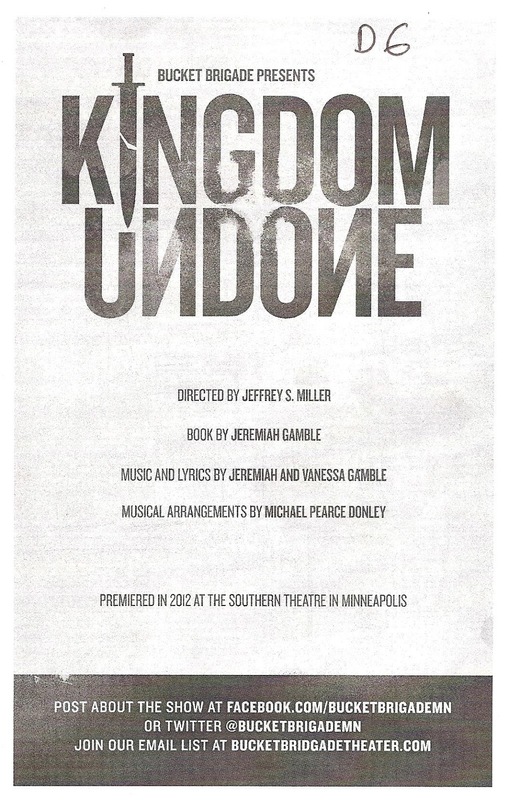 Kingdom Undone continues through April 2, presenting a modern and relatable take on an ancient and often told story.